Background: The treatment of a bacterial infection when the bacterium is growing in a biofilm is a vexed issue. This is because the bacteria in a biofilm behaves differently compared to the individual planktonic free-form. As a result, traditional antibacterial agents lose their activity. Objective: Presently, there are not many drugs that are effective against bacteria growing in biofilms. 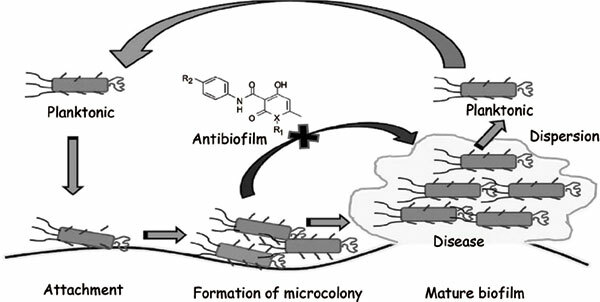 Based on literature reports, we have sought to develop novel derivatives of 4-hydroxy-2- pyridone as both antimycobacterial and antibiofilm agents. Methods: The pyridone derivatives were synthesized by reacting 4-hydroxy-6-methyl-2H-pyran-2- one with appropriate amines and followed by reaction with substituted phenyl isocyanates as reported in the literature. Results: Four compounds in this series significantly inhibit the growth and formation of biofilm by Mycobacterium smegmatis (mc2 155 strain) at 50 µg/ml. Further, in silico evaluation of the ADME parameters shows that these compounds possess good drug-like properties and have the potential to be developed both as antibiofilm and as oral antimycobacterial agents. Conclusion: This finding is of significance as presently very few small molecules are known to inhibit biofilm formation in mycobacteria. These compounds are unique in the sense that they are more potent against Mycobacterium smegmatis in the biofilm state compared to the planktonic form. Antibacterial agent, 4-hydroxy-2-pyridones, δ-pyrones, antibiofilm agents, antimycobacterial, Mycobacterium smegmatis.